1 stencil brush : bamboo ; 5.5 x 0.25 in. 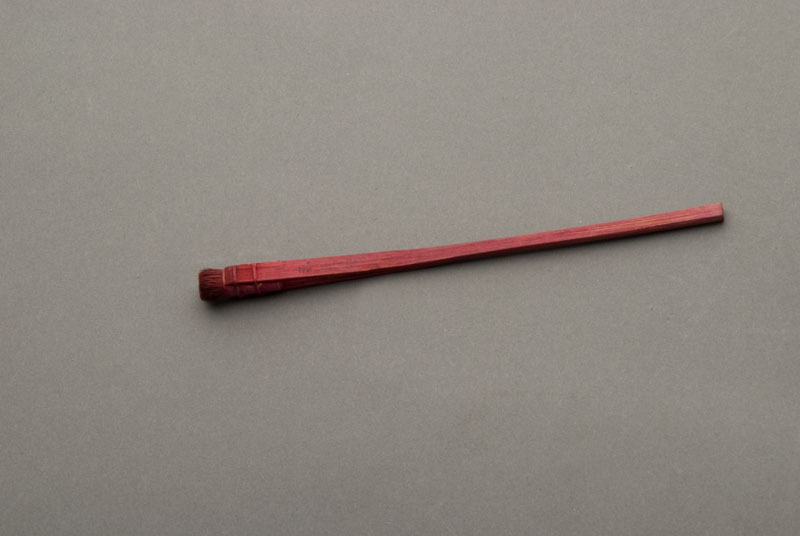 Reddish-pink mon-no-burashi (mon stenciling brush) with bamboo handle (5.25 in.) and short bristles (0.25 x 0.25 in.). Handle is split to incorporate band of bristles. Bristles are all same length. Japanese characters written in blue ink on handle is hard to read due to red coloring. Mrs. Shizu Kaigo used the mon-no-burashi (mon stenciling brush, or literally "mon brush") to dust off stencil when making kamon or mon (Japanese family crest) for the Japanese community in Hawaii.